New York University Press, 9781479831180, 240pp. A thorough and captivating exploration of how mass incarceration and law and order policies of the past forty years have transformed immigration and border enforcement Criminal prosecutions for immigration offenses have more than doubled over the last two decades, as national debates about immigration and criminal justice reforms became headline topics. What lies behind this unprecedented increase? From Deportation to Prison unpacks how the incarceration of over two million people in the United States gave impetus to a federal immigration initiative--The Criminal Alien Program (CAP)--designed to purge non-citizens from dangerously overcrowded jails and prisons. 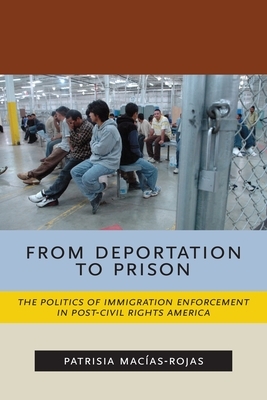 Drawing on over a decade of ethnographic and archival research, the findings in this book reveal how the Criminal Alien Program quietly set off a punitive turn in immigration enforcement that has fundamentally altered detention, deportation, and criminal prosecutions for immigration offenses. Patrisia Mac as-Rojas presents a "street-level" perspective on how this new regime has serious lived implications for the day-to-day actions of Border Patrol agents, local law enforcement, civil and human rights advocates, and for migrants and residents of predominantly Latina/o border communities.